The Swing Shift Shuffle is a radio program of swing, big band, jazz, boogie woogie and other popular music from the 1930's and 40's that airs every Wednesday from 6:00 to 8:00 p.m. (US Central Time) on WEVL 89.9 FM in Memphis, Tennessee, with a live webcast at wevl.org. In addition to the radio show, this blog is dedicated to all aspects of the Swing Era, including art, automobiles, cartoons, comics, history, movies, music, news, science, technology, and anything else that happened during that time. It also includes announcements about events in the Memphis/Mid-South area related to the Swing Era, such as classic movies, concerts, dances, lectures, etc. If you see something that fits the description, send it to me at tim@wevl.org. If you would like more information about the radio show, just go to the Radio Show FAQ page. Time for more pictures from the Nazi Propaganda filmstrip Der Atlantik Wall. We see examples of concealment and camouflage in the photos below. 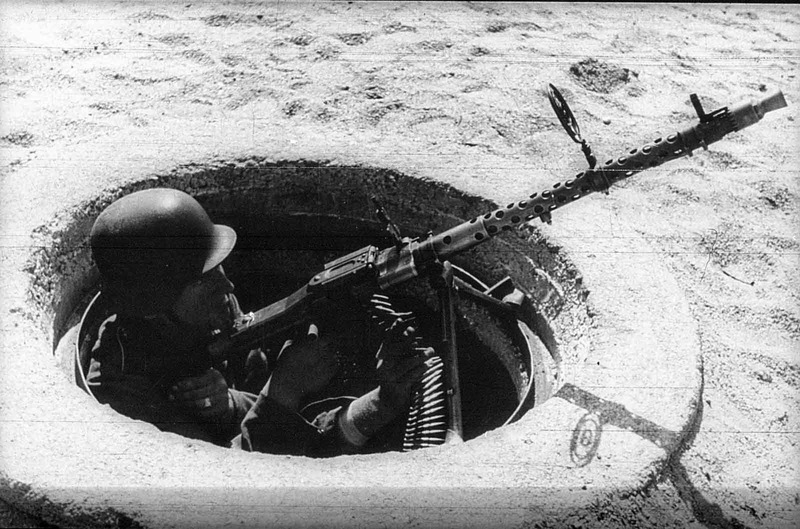 The first shows a German soldier in a machine gun turret almost completely buried in the sand, making it a very effective defensive position against ground assault. 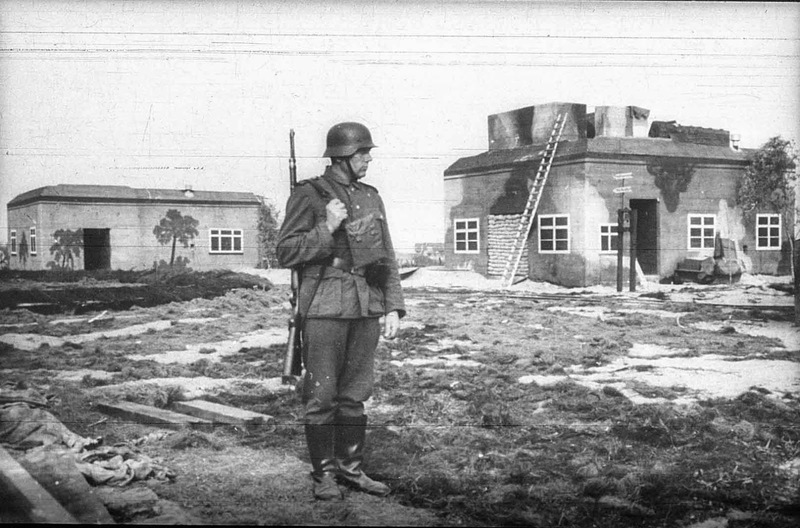 The second image has a soldier standing guard in front of two blockhouses. Note that the windows on the structures are actually just painted on the walls, as are the trees on the building to the left. The purpose of these artistic embellishments was to make these fortified bunkers appear - at least at long range - to be civilian buildings of little military value. Today's Sunrise Serenade was "The Object Of My Affection" by Lionel Hampton. Click on the song title to listen courtesy of Jazz On Line. The playlist for the July 30, 2014 broadcast of the Swing Shift Shuffle has now been added to the playlist filing cabinet. The Hollywood Revue's monthly preview of programming on TCM is out. For August, it is Summer Under the Stars, with each day featuring a different actor/actress, including 14 that have never been featured before on SUTS. The list includes David Niven, Walter Pidgeon, Judy Garland, Barbara Stanwyck, Paul Muni, Jimmy Stewart, William Powell, Carole Lombard, Cary Grant, Claudette Colbert, Betty Grable, and Alan Ladd. This morning's Sunrise Serenade was "I Want A Roof Over My Head" by Louis Jordan. Click on the song title for a sample from emusic, or click here for the album page. The Red Hot Lindy Hop lesson and session switches to the Madison Dance Studio (inside Minglewood Hall, 1555 Madison Avenue) this Friday night. Free beginner lesson at 7:00 p.m. Free admission before 7:00 and $5 thereafter. Lesson by Pip and Angela, with music by Yours Truly sitting in as guest DJ. Dress like you are going out! The Tiger Rag lessons and guided practice sessions are in full swing at the Madison Dance Studio in Minglewood Plaza, 1555 Madison Ave Memphis, TN 38104. Learn more and register here. Today's Sunrise Serenade was "Reed Rapture" by Stan Kenton's Sax Quintet. Click on the song title to listen courtesy of Jazz On Line. 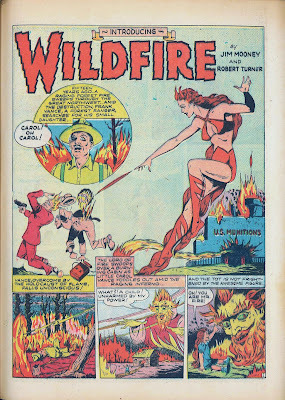 The "Lord of the Fire" spares a forest ranger's fearless little girl from a forest fire, giving her control over flames. After being adopted by a wealthy family she grows up to be a beautiful socialite, and secretly "Wildfire, Princess of Flame, Nemesis of all who break man's laws." Posted on Four Color Shadows. This morning's Sunrise Serenade was "It's A Pity To Say Goodnight" by Ella Fitzgerald with the Delta Rhythm Boys. Click on the song title to listen courtesy of Jazz On Line. Not for the lactose intolerant is this encore from 2011. Three little kittens lost their mittens, so their mother sends them to bed without their supper (e.g., milk). Dreaming of milk, they take a Jules Verne-like ride to the "Milky Way," where the dairy gags start to flow. From the Internet Archive, here is the 1940 MGM animated short, The Milky Way. This morning's Sunrise Serenade was "By The River Sainte Marie" by Johnny Mercer. Enjoy the video from Dailymotion. As we proceed on our traveloguish journey through the Nazi propaganda filmstrip, Der Atlantik Wall,﻿ we start to see signs of more heavy duty defenses. 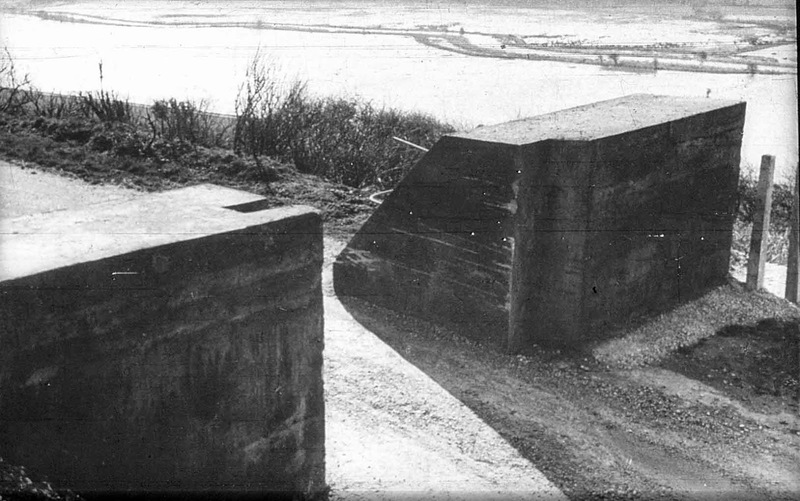 Both of the photos below appear to show obstacles designed to slow or stop vehicles such as tanks or amphibious landing craft. Today's Sunrise Serenade was "The Jumping Jive" by the Andrews Sisters. Click on the song title to listen courtesy of Jazz On Line. The playlist for the July 23, 2014 broadcast of the Swing Shift Shuffle has now been added to the playlist filing cabinet. This morning's Sunrise Serenade was "Song Of The Volga Boatmen" by Glenn Miller and His Orchestra. Click on the song title to listen courtesy of Jazz On Line. The Red Hot Lindy Hop lesson and session continues this Friday night at the Rumba Room. Free beginner lesson at 7:00 p.m. Free admission before 7:00 and $5 thereafter. Lesson by Justin and Meghan, with music by DJ Justin. Today's Sunrise Serenade was "How Deep Is The Ocean" by Benny Goodman and His Orchestra with Peggy Lee on vocals. Click on the song title to listen courtesy of Jazz On Line. Retronaut posted this item about Separate Cinema Archive, a film memorabilia collection devoted to African-American cinema. This post features some of the movie posters in the collection, including several from the Swing Era featuring notables like Cab Calloway, Duke Ellington, Lena Horne and at left, Louis Jordan. This morning's Sunrise Serenade was "Pardon Me Pretty Baby" by Joe Venuti's Blue Four. Click on the song title to listen courtesy of Jazz On Line. This encore from 2011 features the original "Tom and Jerry," a pair of Van Beuren Studios characters who were around before MGM launched its famous cat and mouse team of the same name. In this short, they take advantage of their cartoon world existence by drawing a few things into reality, and then generating a few songs. From the Internet Archive, here is the 1932 short, Pencil Mania. This morning's Sunrise Serenade was "Miss Otis Regrets" by Jimmie Lunceford and His Orchestra. Click on the song title to listen courtesy of Jazz On Line. Carrying on our journey through the landscape "documented" by the Nazi propaganda filmstrip Der Atlantik Wall, the military images have now completely taken over from the initial scenery. 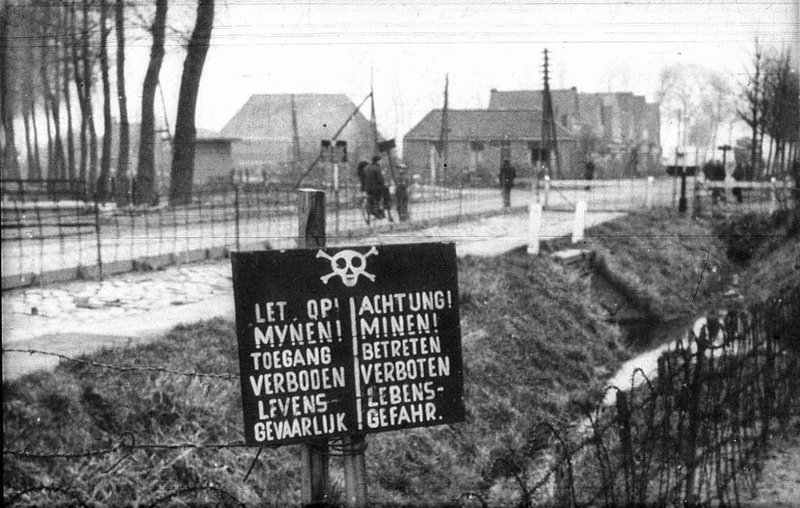 In the photo below, a sign warns that entry is forbidden into a minefield. The fact that the sign appears to be in Dutch and German is further evidence that the locations shown in the film are in Holland. The shot below is one of the most simple yet ominous in the entire filmstrip. 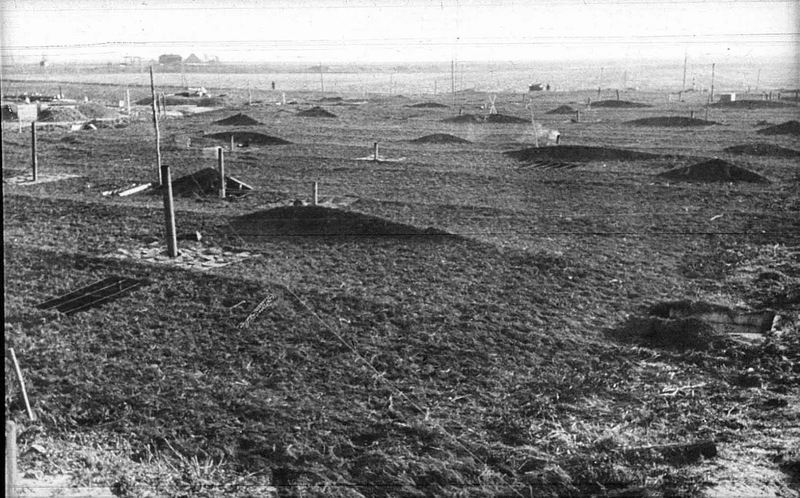 While photos of artillery positions are indeed menacing (and there are such images later in the film), nothing suggests the gore of infantry fighting like barbed wire. Today's Sunrise Serenade was "Christopher Columbus" by Fletcher Henderson and his Orchestra. Click on the song title to listen courtesy of Jazz On Line. The playlist for the July 16, 2014 broadcast of the Swing Shift Shuffle has now been added to the playlist filing cabinet. The Red Hot Lindy Hop lesson and session continues this Friday night at the Rumba Room. Free beginner lesson at 7:00 p.m. Free admission before 7:00 and $5 thereafter. Lesson by Jaredan and Brooke, with music by DJ Jaredan. This morning's Sunrise Serenade was "The Green Grass Grows All Around" by Louis Jordan and His Tympani 5. Click on the song title to listen courtesy of Jazz On Line. This morning's Sunrise Serenade was "Hullabaloo" by Ambrose and His Orchestra. Enjoy the video from YouTube. This encore from 2011 is a Famous Studios production from 1947 featuring a nice swing/jive vibe. A wolf dresses up as "Little Boy Blue," and blows his horn to catch some jitterbugging lambs, who are saved by their hip uncle, the "black sheep" of the family. From the Internet Archive, here is Much Ado About Mutton. This morning's Sunrise Serenade was "Rain" by Jimmie Lunceford and His Orchestra. Click on the song title to listen courtesy of Jazz On Line. 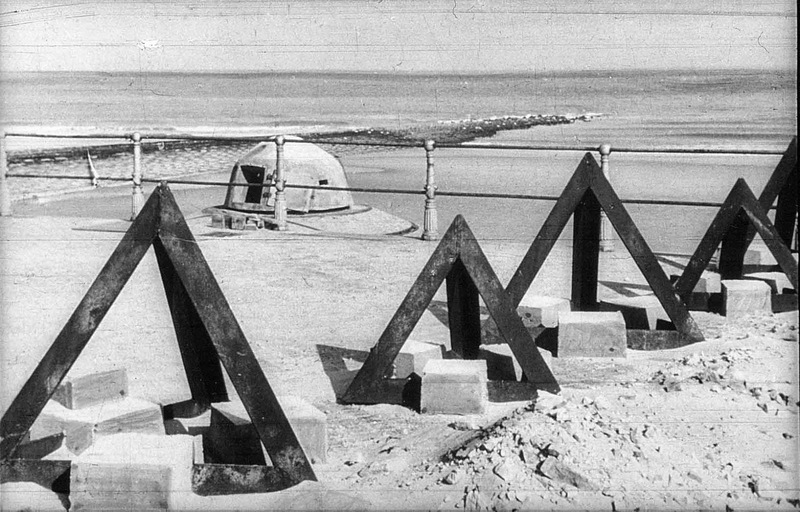 As we continue the examination of the Nazi propaganda filmstrip Der Atlantik Wall, the images begin to take on a much more military tone, with photographs of actual fortifications. 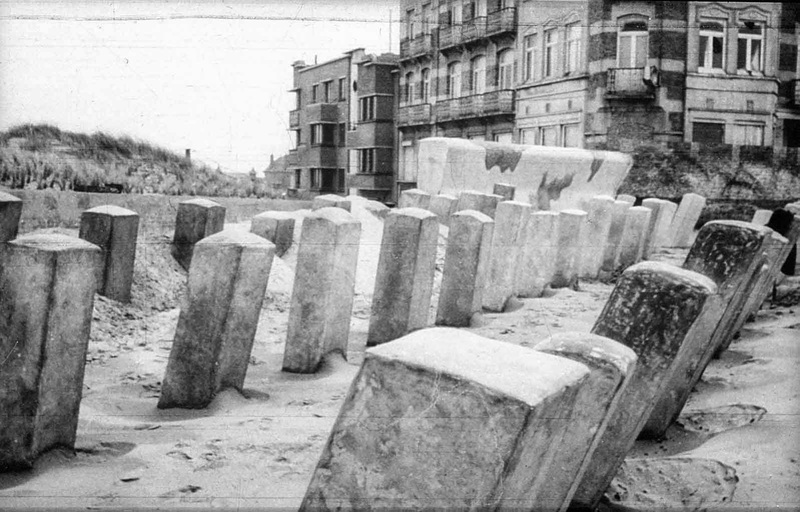 In the first picture below we see what appears to be barricades on a path or road near a beach. While I am certainly not sure of the subject in the next photo, it seems to show the tops of underground bunkers, with ventilation pipes and possibly entrances. Today's Sunrise Serenade was "Buzz, Buzz, Buzz" by Jimmie Lunceford and His Orchestra. Click on the song title to listen courtesy of Jazz On Line. The playlist for the July 9, 2014 broadcast of the Swing Shift Shuffle has now been added to the playlist filing cabinet. Here is Superman's favorite reporter, Lois Lane (a/k/a Noel Neill) up for a set of tennis. Posted on Film Noir Photos, Ms. Neill played Lois Lane in both the Superman movie serials of the late 1940's, as well as in the later television series. This morning's Sunrise Serenade was "Posin'" by Tommy Dorsey and His Orchestra. Click on the song title to listen courtesy of Jazz On Line. 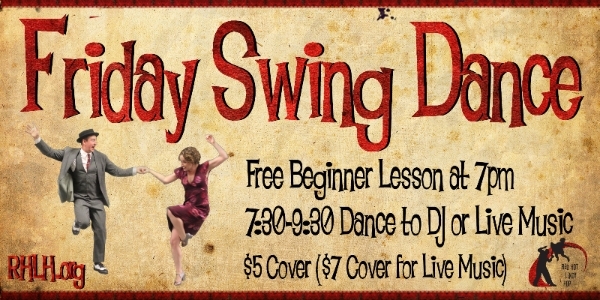 The Red Hot Lindy Hop lesson and session continues this Friday night at the Rumba Room. Free beginner lesson at 7:00 p.m. Free admission before 7:00 and $5 thereafter. Lesson by Pip and Amanda, with music by DJ Amanda. Today's Sunrise Serenade was "For Dancers Only" by Jimmie Lunceford and His Orchestra. Click on the song title to listen courtesy of Jazz On Line. 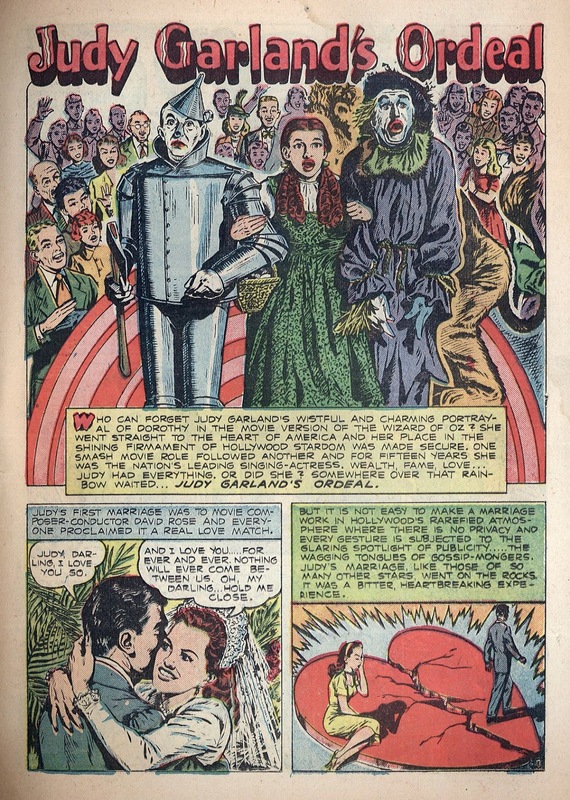 In the days before "biopics," there were "biocomics," such as this example from 1950, posted on Four Color Shadows, entitled Judy Garland's Ordeal. 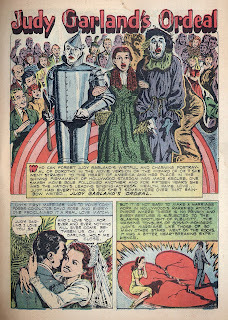 It was no secret that Judy had some troubles in her life, but in addition to the tabloids and gossip columnists, even comic books joined the act. Her then five year old daughter Liza (as in Minnelli) even shows up. This morning's Sunrise Serenade was "Four Or Five Times" by Jimmie Lunceford and His Orchestra. Click on the song title to listen courtesy of Jazz On Line. Since today is Independence Day, and Friday is cartoon day here on the SSS, this bit of cartoon patriotism seemed most appropriate. From the Internet Archive, here is Bunker Hill Bunny. 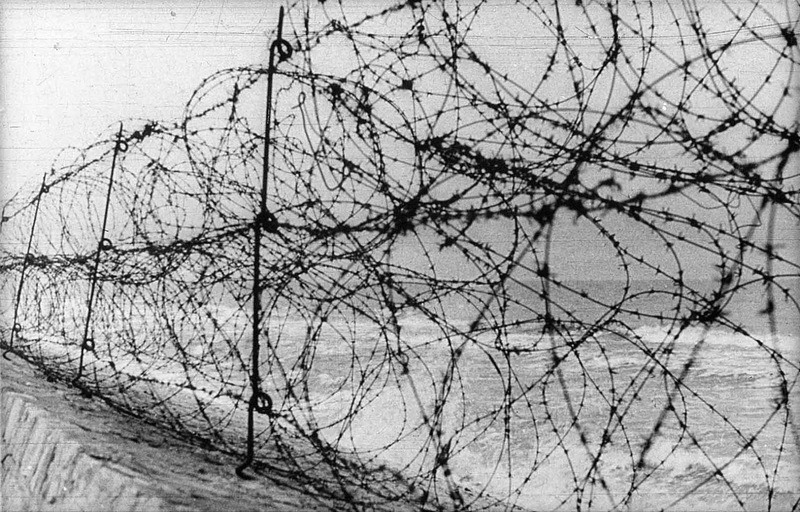 As we continue our tour through the Nazi propaganda filmstrip, Der Atlantik Wall, we start to see more images of military installations. Once again, based only on certain clues from various photos in the filmstrip, these pictures may be of locations in Holland. If anyone recognizes these scenes, I would be really interested to know what they are. 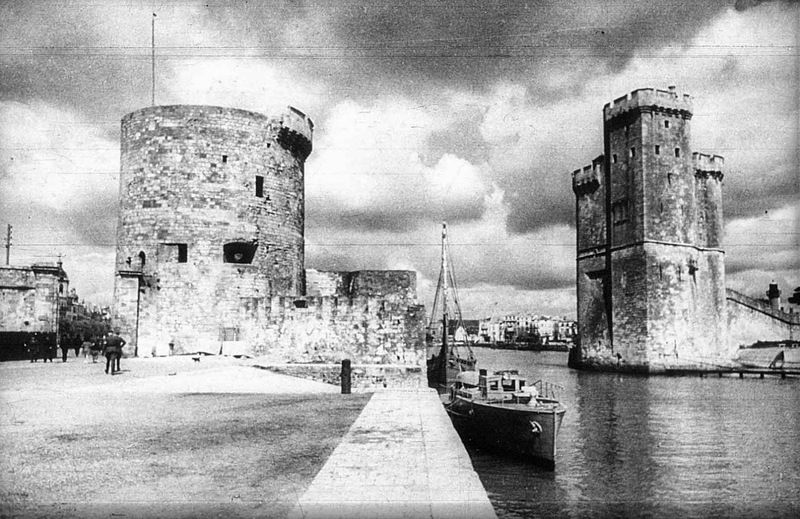 The first image appears to show a medieval fortification at a harbor or port, with some civilians and German military personnel at left. 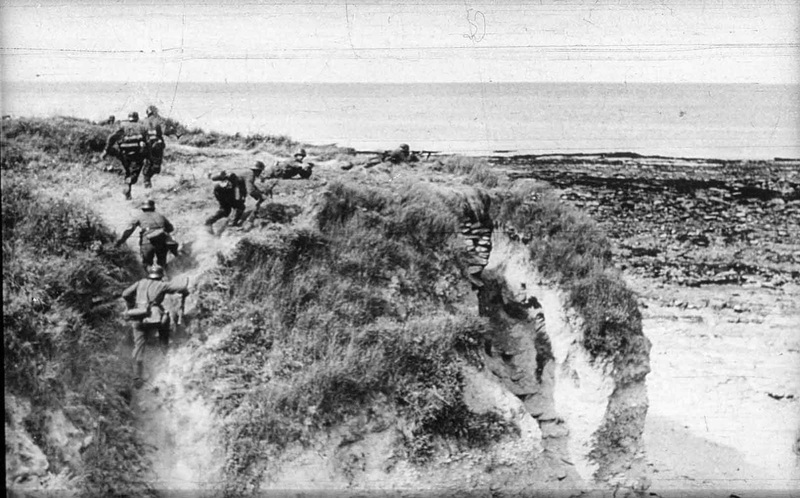 The next photo has a more generic location, but it shows more military activity, with German soldiers scrambling around dunes on a beach. Today's Sunrise Serenade was "My Blue Heaven" by Glenn Miller and His Orchestra. Click on the song title to listen courtesy of Jazz On Line. The playlist for the July 2, 2014 broadcast of the Swing Shift Shuffle, the Independence Day Special, has now been added to the playlist filing cabinet. 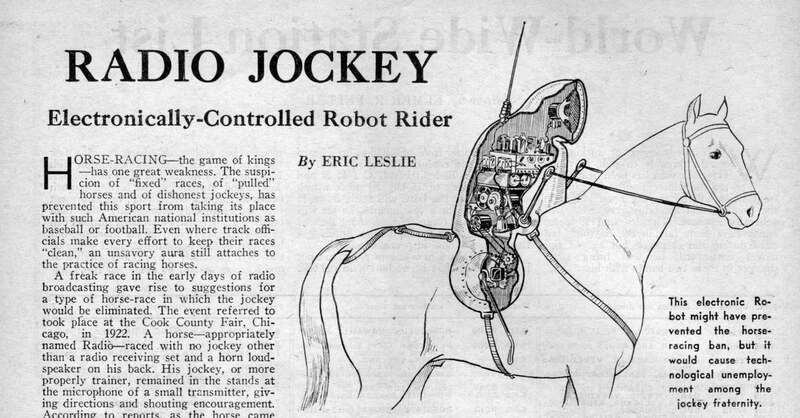 When I was a kid, although I do not remember how old, I once witnessed a form of horse racing that took place in an arena, with small metal boxes painted like jockeys atop small horses. The mechanical riders had metal rods sticking out the back that tapped the horse on its back to spur it on in the race. This post on Paleofuture, featuring an article from the March 1945 edition of Radio Craft, reveals that such an idea arose well before my experience. This morning's Sunrise Serenade was "Loch Lomond" by Fats Waller. Click on the song title for a sample from emusic, or click here for the album page. Start the fireworks before the sun sets as the Red Hot Lindy Hop lesson and session continues this Friday night at the Rumba Room. Free beginner lesson at 7:00 p.m. Free admission before 7:00 and $5 thereafter. Lesson by Jim and Angela, with music by DJ Kimmie. Today's Sunrise Serenade was "Boo-Wah Boo-Wah" by Cab Calloway and His Orchestra. Click on the song title to listen courtesy of Jazz On Line.